NASA will reveal new findings about near-Earth asteroids during a press conference this Thursday (Sept. 29), agency officials announced today. 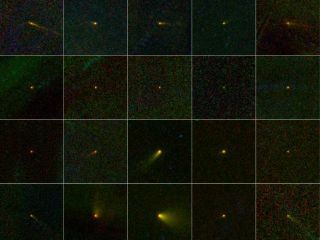 Scientists will present results based on data gathered by NASA's Wide-field Infrared Survey Explorer (WISE) spacecraft. The briefing will take place at 1 p.m. EDT (1700 GMT) Thursday at NASA headquarters in Washington, D.C., and it will have "implications for future research," NASA officials said in a media advisory. Lindley Johnson, NEO program executive, NASA Headquarters, Washington, D.C.
Amy Mainzer, NEOWISE principal investigator, NASA's Jet Propulsion Laboratory, Pasadena, Calif.
Tim Spahr, director, Minor Planet Center, Smithsonian Astrophysical Observatory, Cambridge, Mass. Lucy McFadden, scientist, NASA's Goddard Space Flight Center, Greenbelt, Md. The $320 million WISE telescope launched in December 2009 and spent 14 months scanning the heavens in infrared light. It shut down in February 2011. NASA has a special interest in asteroids. In 2010, the Obama Administration directed the space agency to send astronauts to a space rock by 2025, as part of a plan to get people to Mars by the mid-2030s. And NASA recently announced that it will launch an $800 million asteroid sample-return mission called Osiris-Rex in 2016. Osiris-Rex will rendezvous with a potentially dangerous asteroid called 1999 RQ36 in 2020, snag a few samples, and return them to Earth in 2023. Since 1999 RQ36 is packed full of carbon-based compounds — the building blocks of life as we know it — the mission could shed light on how life originated on Earth. It could also help scientists better understand how to prevent or mitigate asteroid impacts, researchers have said.